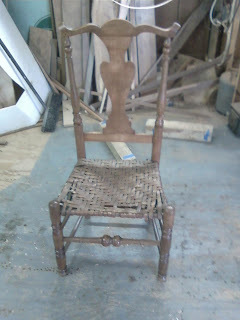 Below are some photos of a chair I have been working on. The chair is a Queen Anne side chair from New England. It dates to somewhere between 1715 and 1740. These chairs, often called "Splat Back" chairs or "Fiddle Back" chairs were made in the southern sections of New England during the first half of the 18th century. The form evolved from an earlier style called "Bannister Backs" which would have three or four uprights in the back cut to resemble the silhouettes of turned columns. The single vasiform splat probably came from English pieces which in turn got the idea from Chinese influences. These chairs were made with straight backs that were set at an angle for comfort. Later Queen Anne side chairs would have a curved splat that would accommodate the back of the seated person. 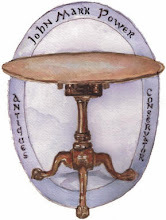 The turnings are largely a holdover form the earlier William and Mary chairs, most notably the modified ball and ring motif on the front stretcher. At first, I thought that there was some later Chippendale influence in the crest rail design with the upturned wings, but I have found several examples like this one which have the same design all firmly established in the American Queen Anne period. The legs, splat, and shoe of the chair are made from Maple, the splat and shoe being made from tiger stripe or "Fiddle Back" Maple (the wood used for the back and sides of violins is quarter sawn Tiger Stripe Maple). This probably added to the nick name of " Fiddle Back" chairs, but the main reason for the name is the shape of the back splat loosely resembling that of a violin. 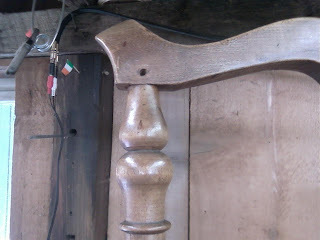 The stretchers are made of Hickory and the crest rail is made from a porous wood resembling Walnut but lighter in color. It could be a light piece of Walnut or perhaps Butternut or even Birch. One other notable characteristic of this chair is the height of the shoe above the seat. 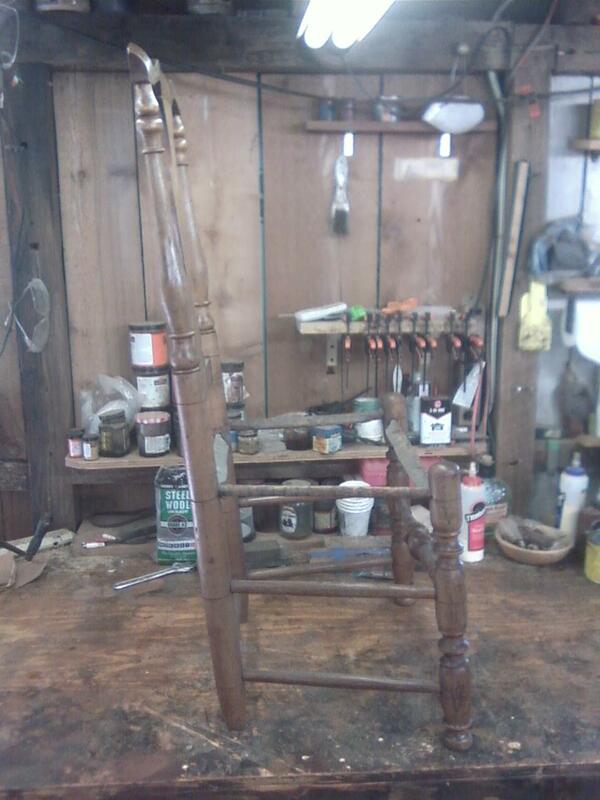 This is seen in most forms of this chair and again is a carry over from the earlier "Bannister Back" chairs. I read that most of these chairs would have been painted originally, but I saw no evidence of this on this chair. 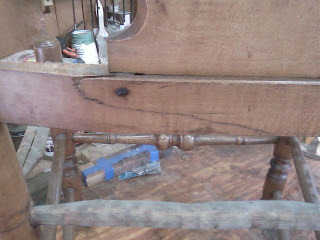 The finish is shellac based and as been with the chair for some time. It is a completely restorable finish. Over all the chair is in pretty good shape considering the age. It was a little loose and needed a new seat. 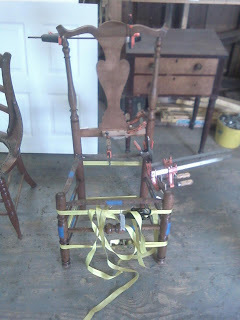 The original seats for most of the chairs were rush and not splint so replacing the seat does not affect the value. 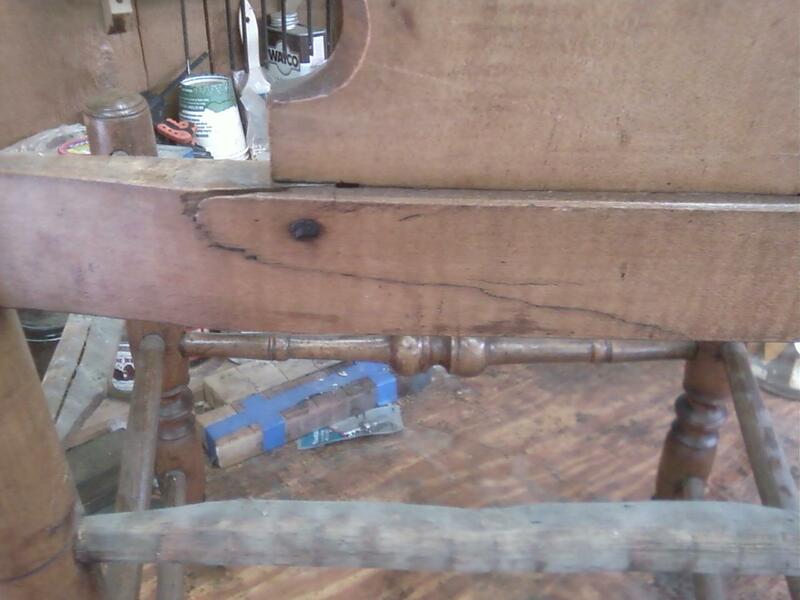 Below are some photos of the chair and the repairs done to it. The Chair as it came to me. Here is a side view showing the back sloping rake which made the chair more comfortable. Here is a photo of the back of the shoe where an old repair of a nail was made. this may have worked for a time, but pressure on the shoe has opened up the break again. 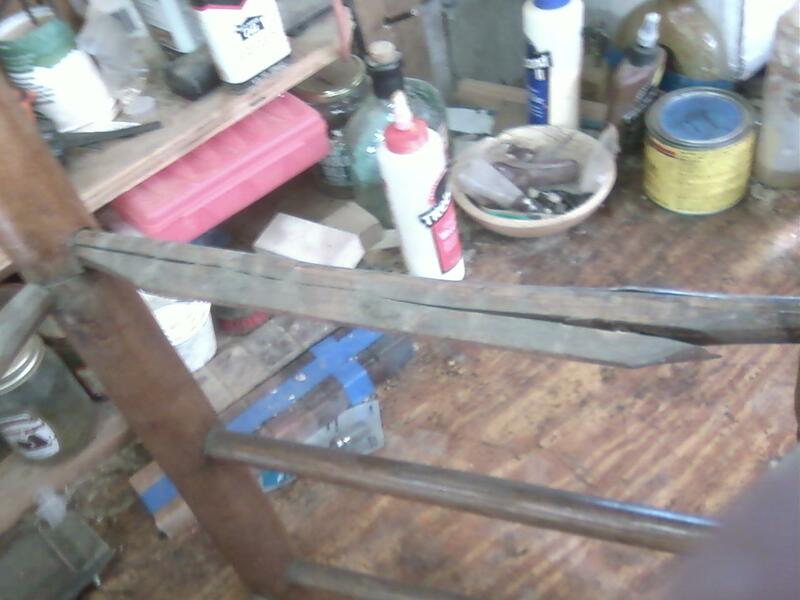 After the seat was removed, I found that one of the Hickory stretchers for the seat was badly cracked. Luckily it could be repaired and did not need to be replaced. The crest rail was attached with pinned mortise and tenon joinery. This is the only place that the chair was pinned. On the left side (facing) the pin had fallen out, so I carved a replacement. Here is a photo of the chair being tightened (using appropriate hide glue) and all of the above repairs being made. In a future entry I will show the restoration of the finish.